“ Smiling face sign” is observed 1st time by radiologist Dr.M.Adinarayana rao & et all (Dr.Prasad reddy, Dr.Ramakrishna) while teaching the 3D FIESTA MR images of cross sections of Internal acoustic meatal contents to radiology post graduate students & junior radiology consultants. 3D FIESTA sections perpendicular to long axis of internal acoustic meatus specially lateral 1/3, demonstrate image ( Fig.1) with facial nerve at anterio-superiorly, Acoustic nerve at anterio- inferiorly and superior, Inferior divisions of vestibular nerve posteriorly. All these structures are surrounded by CSF. Rotate same image 900 clock wise ( Fig. 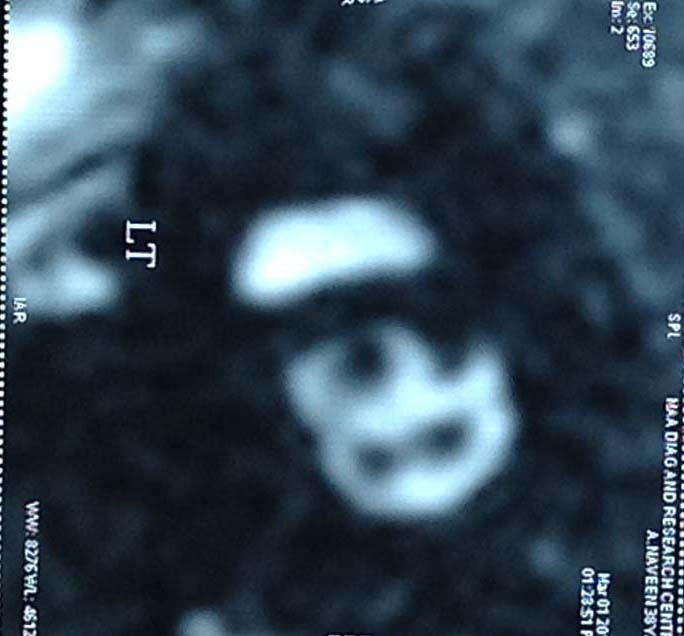 2).Then” smiling face sign” is observed . All CSF is like face with chubby cheeks , Acoustic nerve as Left orbit, facial nerve as Right orbit, superior ,inferior divisions of vestibular nerve as smiling mouth. 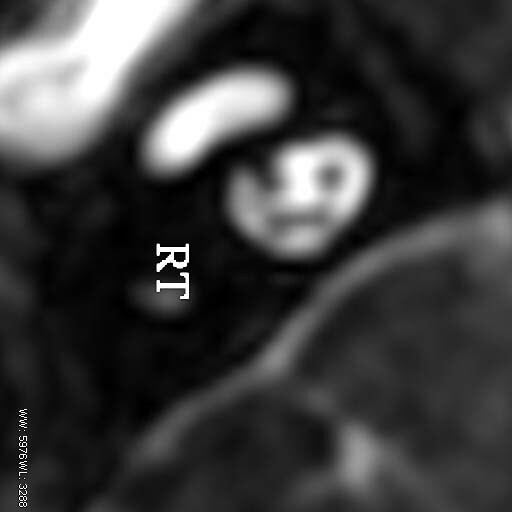 This "smiling face sign” is very useful in radiology teaching. Easy to understand and become easy to familiar, remember the anatomy and retrieve images from memory also. 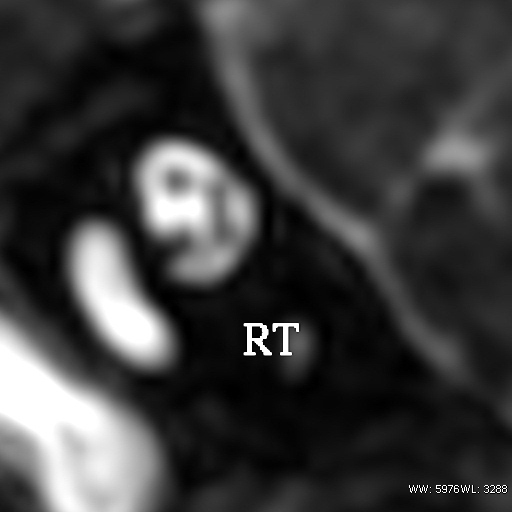 “Smiling face sign” has diagnostic important .If left orbit of face not seen i.e Acoustic nerve agenesis ( Fig 3). 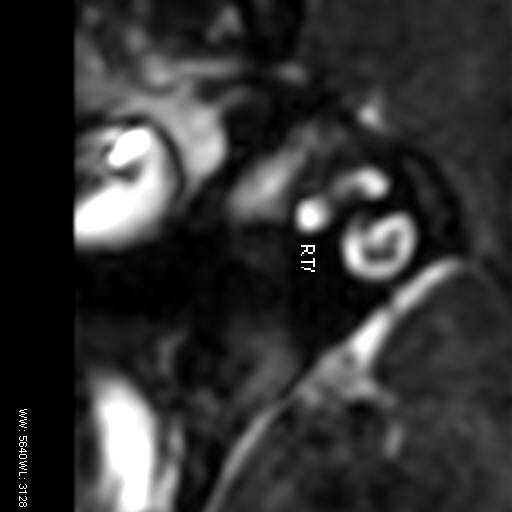 If right orbit not seen i.e Facial nerve agenesis ( Fig 4). SUBMITTED BY: Academic division, 'MA' Advanced Diagnostic & Research Centre, Guntur, AP. INDIA.